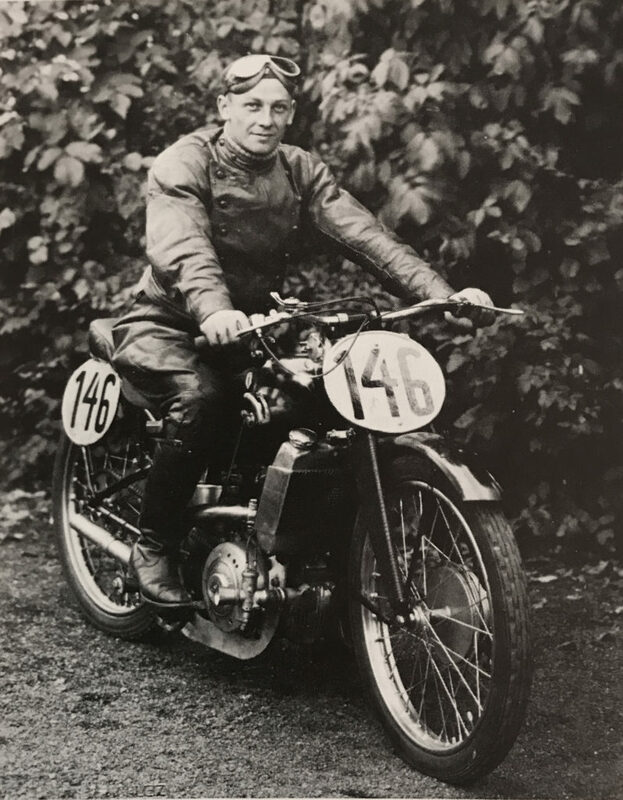 Oskar Schindler in 1928, the year he took up motorcycle racing in his native Czechoslovakia. By nature he was a rogue and a sharp who loved to drink and party, and was charismatic and very charming. He was also an excellent motorcycle racer! Who is this phantastic Oskar Schindler? I know him since we both were in school in the town of my birth, Svitavy (Zwittau) in the Moravian part of Czechoslovakia. He went with my older brother to school and had only one interest…motorcycles! In 1925 he got his first machine. It was a red painted Italian 500cc single-cylinder Galloni. It looked ‘fast’ but with its sidevalve engine it was not a potent instrument. A hopeless thing for any kind of road racing. 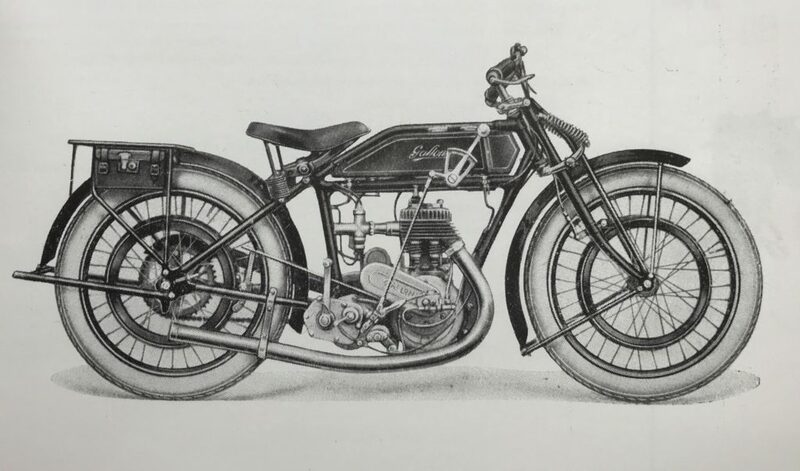 The 1924 Galloni 500cc sidevalve, Oskar Schindler’s first motorcycle. Oskar Schindler solved the speed problem early in 1928. The Galloni was sold and in its place came the dream of every young racing enthusiast, the fabulous 250cc single cylinder OHC Moto Guzzi. The great Italian Pietro Ghersi introduced this racing model in 1926 to the thousands of race spectators during the Lightweight TT in the Isle of Man, and scared with his phantastic practice and race laps not only ‘Ebby’ (then the Chief Timekeeper Mr Ebblewhite), but also all his opponents. Until then the name Moto-Guzzi was known only at home in Italy and even in other Continental countries, only very few of these wonderful machines were ridden in races…Orlando Geissler and Hans Winkler had them in Germany, Joo in Hungary, Vojtech Kolazskowsky in Poland and Peter Roberts in Czechoslovakia. And now, Oskar Schindler, son of an insurance agent and man about town, got one too. All he had was this potent motorcycle, enthusiasm and a lack of experience, when he entered for the Brno-Sobsice race; his first competitive event. He did not win it…he finished third. In front of him were two French Terrot machines. The one with a 250cc OHV JAP engine won, the other with a 175c Blackburne engine finished second. 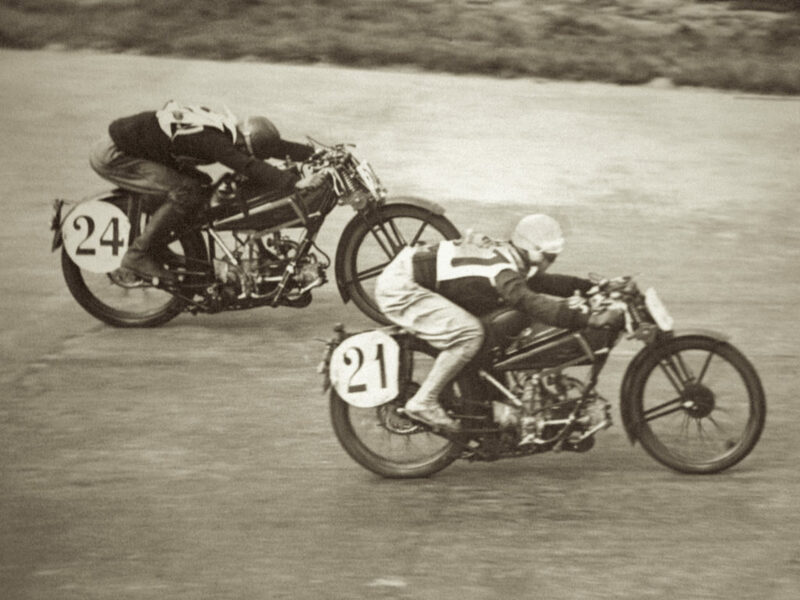 Schindler somehow managed not to drop the model and finished even in front of the second Moto Guzzi, ridden by Peters…he was even faster than the fourth man in the 350cc class on a Sunbeam. Not bad for his first race although I then simply could no understand how a 175cc Blackburne, even with a more experienced rider, could beat such an Italian masterpiece from Mandello del Lario. The second – and last! – event in which Oskar Schindler rode the Moto Guzzi was the Praded Circuit race: near the former Silesian border fo Germany. 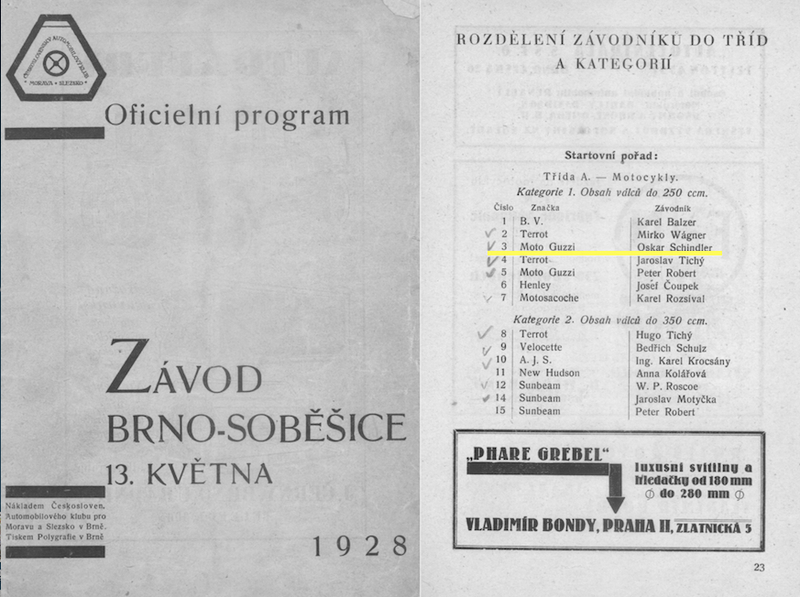 This was a big, interntional race with famous riders from Czechoslovakia, France, Germany, and Poland. Schindler’s opposition in the 250cc class consisted of two factory entered watercooled DKWs ridden by Walfreid Winkler and Kurt Henkelmann; three privately entered DKWs ridden by Kliwar, Horowitz, and Koecher; two more Moto Guzzis ridden by Kolazskowsky and Roberts; Jaroslav Tichy, this time on a 250cc Blackburne engined Terrot which the Dijon factory sent him and of Mita Vychodil, who rode a new JAP engined Coventry Eagle. 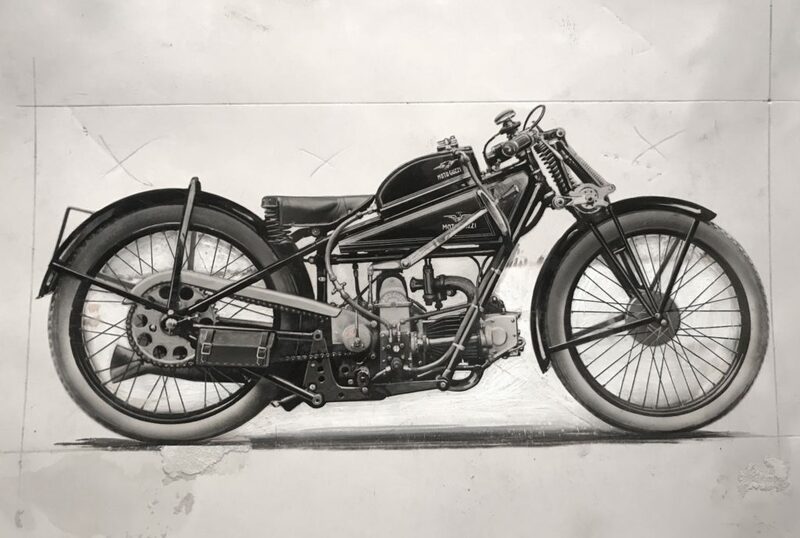 In the other classed we had such famous stars as Toni Bauhofer, Karl Gall and Rudi Ecker on factory entered BMWs; Turek on the first OHC Norton imported to Czechoslovakia, the French champion Perrotin on a 350cc JAP engined Terrot, etc. In short…Schindler was for many laps fifth. Behind the two factory entered DKWs, the Coventry Eagle and Kolazskowski’s Moto Guzzi. After that Guzzi retired, Schindler became fourth and…finished nearly third! Henkelmann, the leader, ran out of fuel in the last lap and pushed…pushed…pushed. Schindler overtook him. 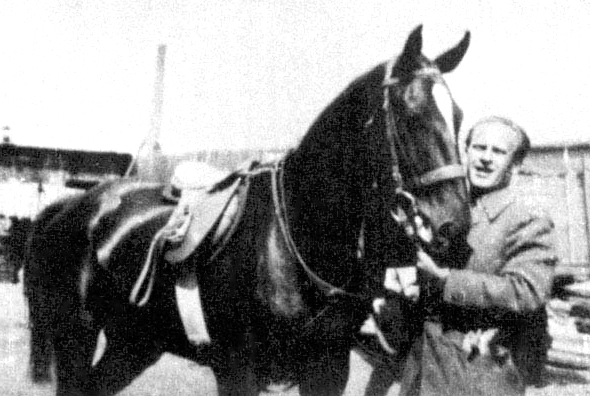 Winkler, the winner had already finished, Vychodil in second place too and…Schindler stopped in front of the finishing line For some unknown reason he had not crossed it when Henkelmann, still pushing and breathless, overtook him. And that gave the Moto Guzzi ridden by Oskar Schindler only a fourth place. There were more races to come, but without Schindler. He could not go on racing…he just could not afford it. And that was the end of Oskar’s racing activities but by far no the finish to his making headlines in newspapers all over the world and to a career which is probably unique in this world of surprises. 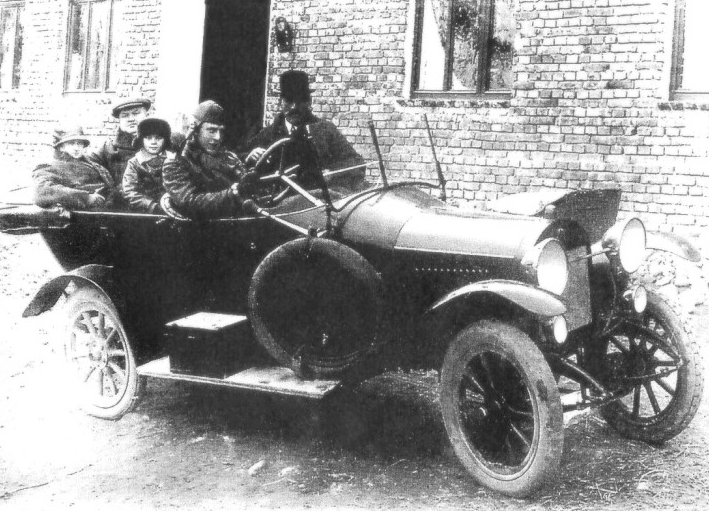 Oscar Schindler driving the family car in 1928 in Svitavy, Czechoslovakia. His look of sullen insolence speaks volumes about his character. Ten years later…1938. Oskar Schindler, born in a town in Czechoslovakia but of German nationality, goes to Germany and later takes over an ammunition factory in Krakow in Poland, where he produces arms for the German Wehrmacht (army). He has no worries with the sale of his products but worries because of shortage of labourers. The Germans need all men for the fighting forces in the east, in the west, in the south and the north and Schindler tells the army bosses that unless he can get inmates from concentration camps – foreigners, prisoners, non-aryans, etc – he is unable to carry on. Eventually, despite protests by the dreaded Gestapo (secret police), he gets his way and takes thousands of these unlucky men and women into his factory…away from the horrible tortures, away from hunger and away from the gas chambers. He goes even further. He kicks out the Gestapo from his factory and bribes other dangerous Germans, who tried to interfere with his human dealings with the ex-concentration camp inmates. How he is not hated by his employees but by the fanatics, and more than once he is in trouble with the crazy politicians. The army comes more than once to his rescue, and also to the rescue of men, hunted despite his protest by the Gestapo in his factory. Not because of pure humanity, but because they need arms…arms…arms. And Schinlder is even not keen on producing many of them or very good ones [and produced only one truckload of ammunition in 3 years! – ed.] 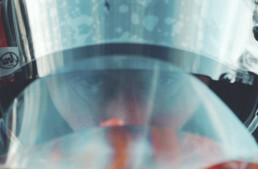 …he just wants to keep himself and his labour force out of trouble. And he eventually succeeds! 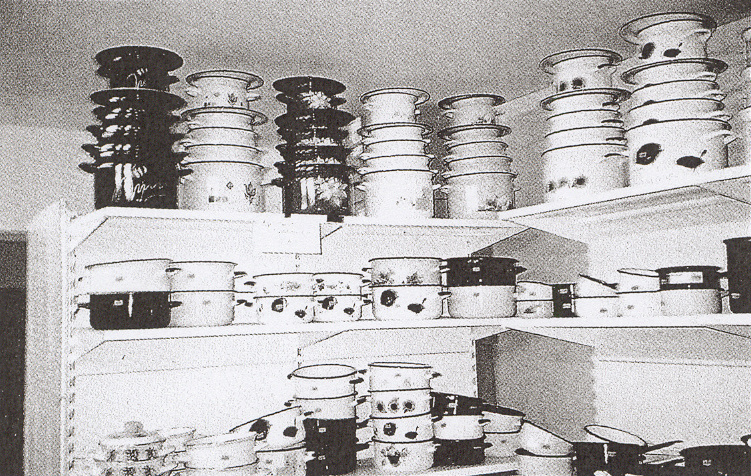 Examples of Schindler’s enamelware from his Polish factory. He later opened a new factory making munitions, ‘essential war work’, that kept his factory running and staffed by Jewish prisoners, who Schindler housed, fed, and kept alive through the end of the war. Near the end of the war, when Poland became for the Germans again a hot place, they moved the factory westward, to Moravia. Schindler insisted on taking his labour force and staff with him and while millions of others died in concentrations camps, Schindler fed them quite well, clothed them and gave them human living conditions. And when, in May 1945, everything broke down for the Germans, he had rescued about 1200 men, women, and children who, without him, would have died. 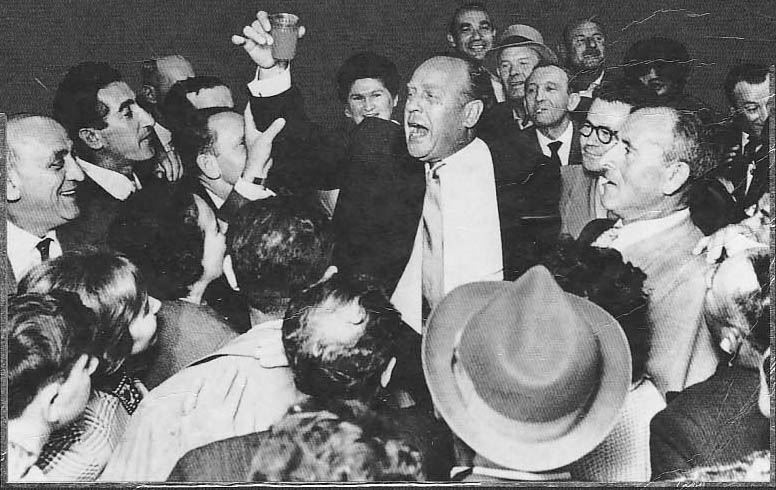 Schindler at a reunion party with his former employees in the 1950s. 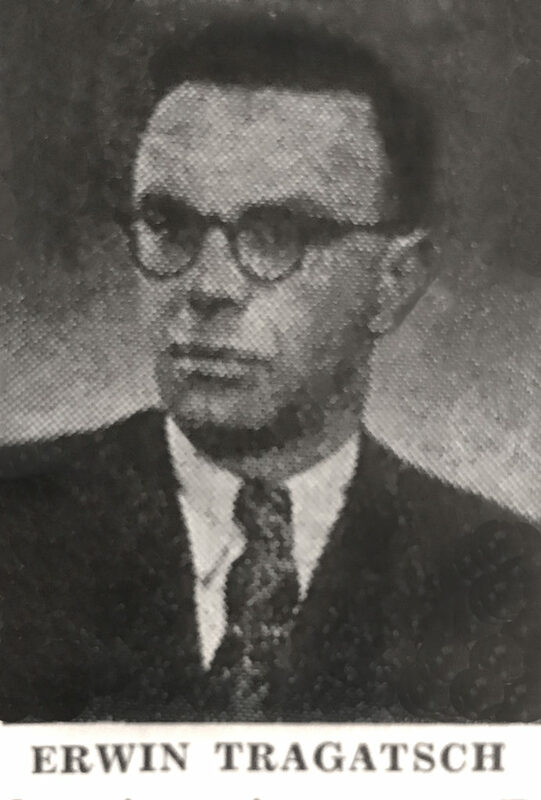 He was later declared a ‘righteous Gentile’ by Israel, not without some controversy (he was a rascal, after all), but ultimately, there was no denying he was nearly unique in saving 1200 Jewish lives in the midst of their horrific abuse and murder at the hands of the Gestapo. 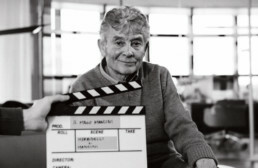 After the war he went to Argentina, but returned in the Fifties to Germany, where he became – at Frankfurt – the owner of a cement factory…still keeping contact with many of these men and women that he rescued and who forever will be thankful to him [in fact his former employees funded him after the war – ed.]. 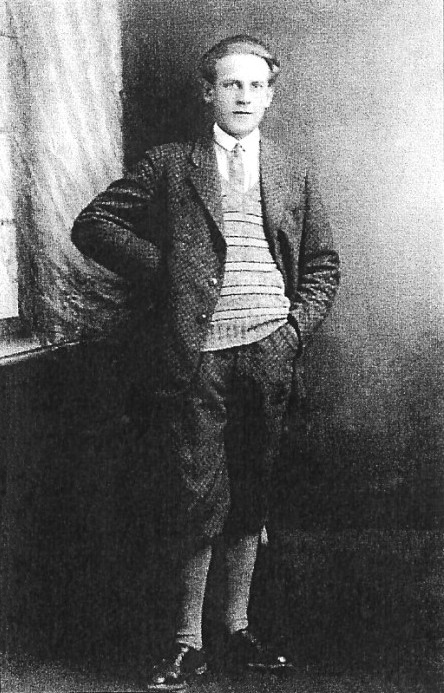 Oskar Schindler, in his period as a racing motorcyclist, was not a famous man. Fame came to him, when his own feeling for humanity proved stronger than anything else and when he, the German, stood not behind a crazy ideology but behind the many British, French, Czechs, Poles, Belgians, Dutchmen and other who, without him, would have died. What a marvelous story! And timely too as our own country seems bound and determined to slip into the internment and incredibly cruel treatment of other peoples, members of minorities and other cultures. Always a timely reminder: there is no ‘them’, there is only us. The nazis are us, their victims are us, we are capable of unspeakable cruelty, and tremendous compassion and self-sacrifice. We are human, everywhere and at all times in history, and ignore the lessons of history at the peril of our souls.